Hanoi was, and still is, locally referred to as the city of Ba Muoi Sau Pho Phuong, 36 streets and districts. In fact, there are more – some 160 of them- so the question arises: why the number 36? The discrepancy arises from two sources. 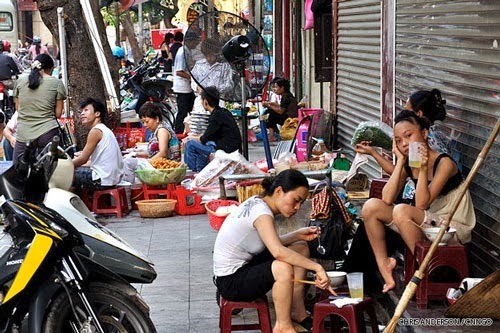 First of all, the word Pho which refers to commercial streets and Phuong meaning districts which refers to both professional guilds and administrative districts, helped to cause the initial confusion. This was later compounded by two folk poems popular throughout the country in the country in the late 19th century. These both praised the beauty of Thang Long ( Ascending Dragon) Hanoi’s ancient name, referring to it as the city of Ba Muoi Sau Pho Phuong, 36 streets and districts, although at the time Hanoi already had 60 commercial streets, 60 professional guilds and 40 administrative districts. However this misrepresentation was not simple a casual error. 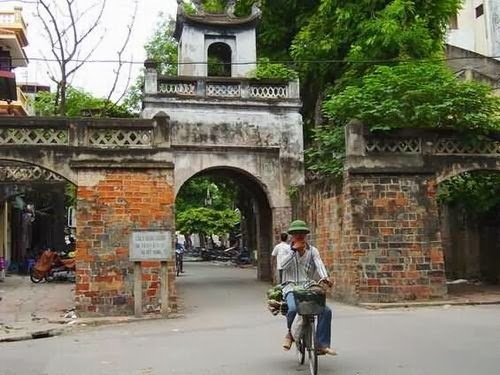 Many people believed that 36, the exact number of streets in Hanoi from the 15th to 18th centuries, was a lucky number and no-body among the superstitious Vietnamese, particularly the poets, who further propagated the discrepancy, wanted to change it. Today, walking through the streets in this ancient heart of the old city, you will find they still bear the name of the trades and commodities plied in them many generations ago and in some the tradition carries on to this day: cotton, sail, rice, sugar, vermicelli ( hang bun), Jute ( Hang Gai) . 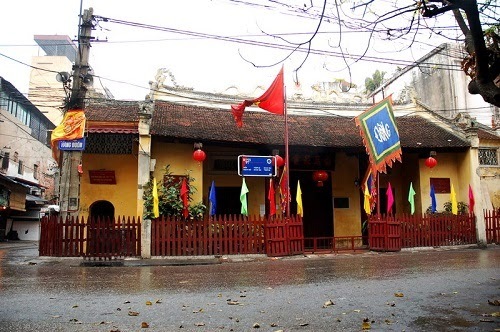 Thus the name, ba Muoi SAu Pho Phuong, like the name of the old streets recalling the professional guilds, national heroes and heroines, historic places and political leaders, remains unchanged to this day. Exploring the maze of back streets is fascinating; some streets open up while others narrow down into a warren of smaller alleys. The area is known for its tunnel, or tube, houses – so called because their small frontages hide very long rooms. These tunnel houses were developed to avoid taxes based on the width of their frontage onto the street. By feudal law, houses were also limited to two storeys and, out of respect for the king, could not be taller than the Royal Palace. These days there are taller buildings (six to eight storeys high) but there are no real high rise buildings. Some of the more specialized streets include Pho Hang Quat which has red candlesticks, funeral boxes, flags and other temple items; and Pho Hang Gai which is somewhat more glamorous with silk, embroidery, lacquer ware, paintings and water puppets – the silk sleeping bag liners and elegant Vietnamese ao dai are very popular with travellers. Finally, no trip to the Quarter would be complete without a trip to Dong Xuan market, on Pho Hong Khoi and Pho Dong Xuan, which was rebuilt after a 1994 fire. A stroll through the historic Hanoi Old Quarter can last anywhere from a few minutes to the better part of a day, depending on your pace and how well you navigate the increasing motor traffic plaguing the streets. However long, or whatever detours you might take, the following course will provide you with a good dose of Vietnamese culture, and some insight into the country’s long history. A logical starting point is the Ngoc Son Temple in the northern end of Hoan Kiem Lake. After crossing back over the bright red Huc Bridge, stop for a quick look at the Martyrs’ Monument, erected to those who died in fighting for Vietnam’s independence. 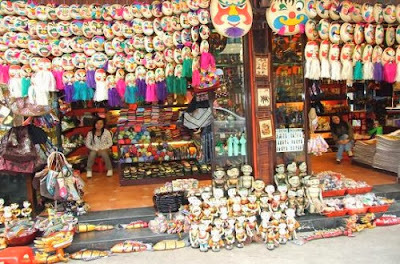 Head north on Pho Hang Dau past the Water Puppet Theatre (see the ‘Punch & Judy in a Pool’ boxed text in this chapter) and you’ll soon be surrounded by shoe shops selling every shape, size and style, demonstrating how serious Hanoians are about their footwear. Crossing over Pho Cau Go, pop into the colourful flower market which occupies the narrow eastern terminus of Pho Gia Nhu. Back on Pho Hang Be; continue north to the ‘T’ intersection with Pho Hang Bac. Near here are several shops that carve intricate gravestones (most bearing an image of the deceased) by hand. A short detour north on Pho Ma May will lead you to the Memorial House at number 87 (see the main text entry earlier in this chapter), an exquisite Chinese merchant’s home that was recently restored and opened as a museum. Return to Pho Hang Bac and head west past a strip of snazzy jewellery shops, then right onto Pho Hang Ngang past a row of clothing shops, and right again onto Pho Hang Buom; this will take you past the small Bach Ma Temple (White Horse Temple). As you pass the pagoda, with its red funeral palanquin, look for its white-bearded temple guards, who spend their days sipping tea. Legend has it that Ly King used the pagoda to pray for assistance in building the city walls because they persistently collapsed, no matter how many times he rebuilt them. His prayers were finally answered when a white horse appeared out of the temple and guided him to the site where he could safely build his walls. Evidence of his success is still visible at Cua O Quan Chuong, the quarter’s well-preserved Old East Gate at the eastern end of Pho Hang Chieu, near the intersection with Pho Tran Nhat Duat. Head west, back along Pho Hang Chieu past a handful of shops selling straw mats and rope to reach one of the most interesting streets, Pho Hang Ma (literally ‘counterfeit street’), where imitation ‘ghost money’ is sold for burning in Buddhist ceremonies – it even has US$5000 bills! Loop around and follow your ears to the sounds of skilful blacksmiths pounding away on metal on the corner of Pho Lo Ren and Pho Thuoc Bac. Moving south on Pho Hang Duong, head right past the towel shops onto Pho Lan Ong, a fantastic row of herb sellers filling the street with succulent aromas. Finally, head south past the tin box makers (opposite the mirror shops) on Pho Hang Thiec, then left toward the interesting shops selling Buddhist altars and statues along Pho Hang Quai. Time permitting, loop around and zigzag west over to check out the leather shops along Pho Ha Trung, working east again to end the tour at the superb, neo-Gothic St Joseph Cathedral (see the main text entry earlier in this chapter). If you’re feeling a bit knackered from the walk, a few steps from the church along Pho Nha Tho there is an alluring cluster of stylish restaurants and cafes. Although many of the streets no longer sell the products after which they were named, some still do. Today, the Old Quarter has become the unique classical feature of Hanoi, and the inspiration of numerous writers, poets, and painters, and one of the desired tourist destinations in Hanoi.